Shellfish Ireland use only the finest crab traditionally caught using pots in the pure clear waters of the Atlantic Ocean - perfect everytime. While every effort has been made to remove shells, some may remain. Our Crab Meat is cooked and ready to eat. 1. 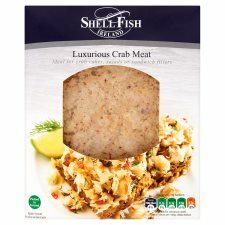 Mix the crab meat with some mayonnaise and chilli sauce. 2. Serve in a tortilla wrap with lettuce, tomato, peppers and onion. 3. Season with salt and pepper if desired. Once opened keep refrigerated between 0-4°C and use within 2 days. Do not exceed use by date. This product has been previously frozen and returned to chilled temperature under controlled conditions and is not suitable for home freezing.